Spectrum Lab's main index, 'A to Z' . While audio streams are processed by SL in real time, they can be saved as a wave file (for "logging", "archiving" etc). You can tap the recorder to any node in SL's circuit window, for example L1/R1 = input, L5/R5 = output, or (for the EbNaut recorder) to the decimated input for the main frequency analyser's FFT . For most applications you will save the input as a wave file to have all opportunities for later post-processing (except, maybe, when only a small portion of the frequency range is of interest and the file size shall be kept low.. more on that later). To start or stop logging, use either the file menu (File..Audio Files and Streams.. 'Save input as audio file' or 'Save output as audio file'), or one of Spectrum Lab's interpreter commands. This feature saves a few seconds (time not wasted in a stupid fileselector box) when in a hurry to record a new file. 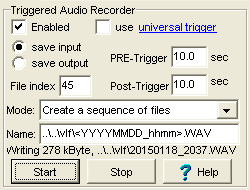 The same applies to the triggered audio recorder, which in fact uses the same filename (or its template) as described above for normal audio logging. While saving the audio stream in a wave file, the progress button will tell you how many kBytes are already written to the file. Be careful not to run out of disk space while logging, because Windows may crash in that case. If this is an issue, use a different partition of even a different harddisk to record wave files. If a GPS is connected (and configured), there may be an auxiliary file (*.aux) written along with each audio file (*.wav). The auxiliary file will contain GPS coordinates, timestamps, and possibly some other data. If you don't need the AUX files, set the GPS output interval to zero in the GPS configuration window. Except for the file extension, aux files have the same names as their corresponding wave audio files. Without auxiliary files, there will only be one single GPS position in an extra chunk ("inf1") of the wave file header. 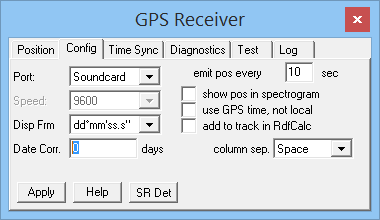 More details about logging (exporting) GPS data along with audio files can be found in an extra document (gps_decoder.htm). As an alternative to the "normal" logging of wave files as explained in the previous chapter, the recording of audio files can also be started automatically (without using the FILE menu, and without the help of the interpreter). For example, you want to record the raw input only if "something interesting" happens (for example, the call of a bat in a certain frequency range). You may also want to record a few seconds before the event actually happened, and a only few seconds after that (to avoid filling the disk with useless data). To configure the triggered recoder, select Options .. 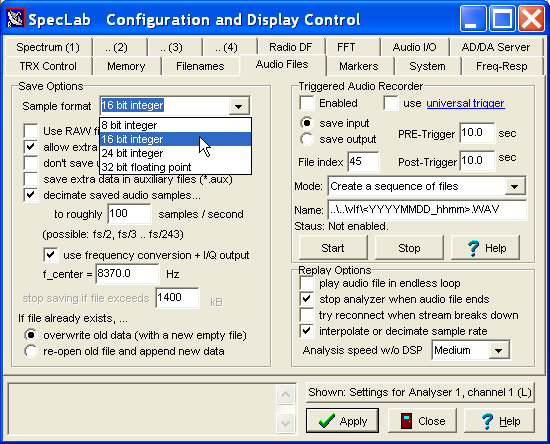 Wave File Settings in SpecLab's main menu, on the panel labelled Triggered Audio Recorder (details in an extra document, please follow the link). To start or stop wave file analysis, use Spectrum Lab's main menu (under "File" ... "Audio Files & Streams" ). If you choose Analyse Wave File without digital signal processing, the analysis runs much faster than 'real time'. The samples from the file won't run through the circuit, instead they go directly into the first spectrum analyser to produce a waterfall and/or spectrum graph. If the "watch window / plotter" is opened, the contents of the plotted graph will also be updated while analysing the file - but much faster than in 'real time'. This mode is also called "Fast File Analysis" mode because it runs faster than the recording time of the file. With Analyse and Play Wave file, the audio data will be read from the wave file and "echoed" in real time to the soundcard's output (if not occupied). Analyse and Play stream / URL does almost the same, but not for a file on your local harddisk, but for an audio stream received from the internet. The URL may be the name of a playlist (m3u = winamp playlist, frequently used in the WWW to link to an audio stream), or the name of an Ogg/Vorbis compressed stream. MP3 compressed streams are not supported directly, to avoid hassle with Fraunhofer's MP3 patents (see Wikipedia on MP3). Thus, the preferred compressed audio file / stream format is Ogg/Vorbis rather than MP3. To analyse files which are not directly supported (see list of supported formats below), play them into SpecLab with an external audio player (like Winamp), or try to use a Winamp-2-compatible "input plugin" as described here. To play multiple files in a certain sequence, use the playlist . Decide which of this file analysis modes you want to use by choosing the corresponding submenu. Then a file selector box opens in which you can select the audio file. To analyse more than one file in a single over, use the CTRL- or shift-key in the file selector. This way you can select more than one file, like a little "play list". After selecting one or more wave-file to be analysed, a dialog window appears where some parameters of the wave file are displayed. Some parameters (like the sample rate) can be adjusted for the following analysis. The sample rate in a file is often different from the sample rate of the soundcard. For ELF work, the wave files are often decimated to a low sample rate to save disk space. For this reason, you often need a different FFT size to analyse files than for real-time analysis with the soundcard. Before the above dialog opens, the program calculates the best FFT size to achieve a similar frequency resolution as for real-time analysis. The resulting resolution is shown in the audio file analysis dialog (see screenshot above). If you are not satisfied with the FFT settings, you can modify the settings before clicking "OK" to start the file analysis. While the analysis runs, the progress button shows the current playing time, the file name, and some other info. As the name says, it shows a smoothly scrolling waterfall while analysing. So it's the most pleasant setting if you want to see the result while the file is being analysed. Here, the waterfall display is only updated from time to time, so the scrolling will be not as smooth as the slower mode, but it is already much faster than the "slow" mode. Use this, for example, to view the results of an overnight recording session. This means the waterfall will not be updated while the file is being analysed. It will only be updated after the file is finished. This saves a lot of calculation time, so this is the preferred method to analyse very long recordings. But even in this mode, the "watch/plot window" will update the plotted graphs which may show noise level, signal levels in several frequency bands, etc. Note: The option 'plotting the result in fast file analysis mode' was implemented in October 2004. It didn't work in older versions ! When finishing Fast File Analysis, the program will not automatically switch back to real-time operation (analyse samples from the soundcard), because you may want to analyse other files too, and see the result in the same spectrogram and/or plot of analysed data. To return to real-time processing with the soundcard, use the main menu, "Start/Stop"..."Start Audio Thread". Ogg/Vorbis : Supported directly (without the need for a winamp 'input' plugin) since V2.76 . Set the file type to 'Ogg/Vorbis Audio Files (*.ogg)' in the file selector box, which pops up after selecting 'File'..'Audio Files'..'Analyse and Play' (etc). 'SETI 8-bit raw I/Q files' . None of these files requires an extra plugin. These raw, uncompressed, headerless data files - for example, the output of a 16-bit DAC dumped into a file without any format conversion. File sample rate: Enter the number of sample-groups (=channel sample rate) here. For example, if the ADC samples 32000 points per second, with two channels per point, enter '32000' here, and '2' Channels. Data type: at the moment, 8, 16, 24 bits per sample, signed or unsigned, are supported. In addition, 'single' or 'double' precision floating point ("32 bit float"=single, "64 bit float" = double precision). Byte Order: Little Endian aka 'Intel' byte order (least significant byte first), or Big Endian aka 'Motorola' byte order (most significant byte first). Stupid formats which even reverse the bits within each byte are not supported ! File contains I/Q samples: Set this option if the two channels in your file contain I/Q samples, aka quadrature signal, which can be considered complex numbers. Explained in a separate file . The recording and playback can be controlled by interpreter commands, for example through one of the programmable buttons in the left part of the main window. You can assign any function to a button, for example to start / stop a recording, or to temporarily pause replay / analysis. In addition, there's an extra set of commands for the Triggered Audio Recorder . For software defined radio applications, the complex stream received from an external SDR, or the downconverted / decimated signal 'received' with a soundcard, can be saved as a stereo wave file. Note the negative sign before the oscillator's 'sine' output for the 'Q' channel ! Example: When recording an RF carrier at 77500 Hz, with the SDR's NCO (complex Numerically Controlled Oscillator) set to 77490 Hz, the recorded wave file would contain a signal at a baseband frequency of 77500 Hz - 77490 Hz = +10 Hz. To accomodate both conventions, Spectrum Lab can be configured to read and write wave files with both 'polarities' for the Q-channel. Due to a lack of space in various dialog screens, the SL author decided to call the 2nd format (with I=cos(omega*t), and Q=sin(omega*t) for a positive baseband frequency) I/-Q instead of I/Q. If, during analysis of an 'I / Q wave file' the frequencies appear mirrored in the spectrum display, try "I/-Q" instead of "I/Q". Equivalent settings are available for recording as well as analysing I/Q wave files. Wave files recorded by SpectraVue (and, most likely, similar SDR 'frontends') use the 'I/Q' settings. For EbNaut and the vlfrx-tools by Paul Nicholson, use the 'I/-Q' setting instead. For certain applications (like the EbNaut wave recorder), it was necessary to embed some 'extra' information in wave files written by Spectrum Lab. If this causes problems with other programs (which cannot skip such unknown chunks, like very old versions of Spectrum Lab..), you can turn off this feature in the configuration dialog . Contains various "info" as an easily parseable text string (zero-terminated like a "C" string, variable length). Don't assume anything about the number of decimal places, and the parameter sequence. sr= precise sampling rate (samples per second), "measured" or "calibrated". rf= radio frequency (useful if the recording contains downconverted, decimated I/Q samples. glat= geographic latitude in degrees, positive north, negative south. glon= geographic longitude in degrees, positive east, negative west. masl= GPS height in meters above sea level. Only valid (and non-zero) if a GPS receiver is connected and operating . kmh= GPS speed in kilometers per hour . Note: If no GPS receiver is connected, the lat/lon fields may still contain valid data. If GPS is not available (or not activated), the geographic position will be taken from the 'System Settings' . Except for the file extension, aux files have the same names as their corresponding wave audio files. Without auxiliary files, there will only be one single GPS position in an extra chunk ("inf1") of the wave file header. All details about logging (exporting) GPS data along with audio files can be found in an extra document (gps_decoder.htm). 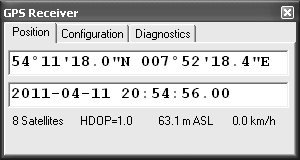 An example of an aux file with GPS- and additional data (added by means of an interpreter command) is here .